Wookiee Rage! Today at Galactic Hunter we look at the meanest Wookiee out there, Chewbacca. The box says he has "Wookiee rage." Isn't that enough to warrant your clicking through to read about him? Read on! Over at TFormers.com, there's a small gallery previewing even more of the repaints of Beast Wars, including a very different looking Wolfang/Howlinger which looks significantly different from previous releases. Also notable: Fan2Fan reports that a Tigatron repaint is coming out in this line. Finally, AcToys.net has a thread with Classics Tank Megatron packaged on a blister card. We assume this is for Europe or some other territory, but hey-- it's interesting and sure to be a collectible for people who love packaging! Over at Wii IGN, there's an article about a new Wii-centric Godzilla title. It's basically a fighting game, but it looks interesting and sounds like it'll be a blast for fans of the classic Japanese monster franchise. Check it out! Also, Figure of the Day has been updated! The daily feature on figures you might have but might not-- either way, here's what you've been missing! Spanning from the original Power of the Force series of 1995 to the latest of the Saga Collection, it's almost like a history lesson! We also added archive pages so you can go through the entire column's run. Hooray! From left to right: Grievous' Bodyguard, Count Dooku, Tanus Spijek, Shaak Ti. These are all new since our last update, and another one will be going live today! Who will it be? Keep checking Galactic Hunter for the next update, with the 275th installment in our ongoing series! Oh, and there's also this auction on eBay with the first-ever look at the 2007 action figure scale Sith Infiltrator. It looks good-- like with the Jedi Starfighter from Episide II, some creative liberties were taken with what it can do. We're fine with this. We expect full color images this month due to Toy Fair. Over at TFW2005.com, you can find a gallery with packaged Ironhide toys! While it's great to get a glance at this early (especially given how we probably won't even see all this stuff at New York Toy Fair this month), we still don't like the aesthetics-- but it looks like it should make for an actually fun toy. We're just, as we will say repeatedly this week, cranky old fanboys who are very set in our 2D gaming, boxy robot, only-three-Star Wars movies point of view. Fortune hath smiled upon thee, for thou hast heard the news of CastleVania: Dracula X Chroncles being previewed at 1up.com, The Magic Box, and Gamespot. Due (according to some sources) September 15, 2007, this PSP collection includes the TurboDuo/PC Engine CD game Rondo of Blood as well as a polygon remake of the same title-- but wait, there's more! The disc also includes a revamped port of 1997's Castlevania: Symphony of the Night. So if you have a PSP, this is probably the second or third must-have game for the system. We don't have one yet, but as we were leaning toward getting one to play the PSP Salamander collection anyway, we're all over this news. Rumors of a PSP price drop continue, especially as (technically) the system hasn't had a drop since the $250 PSP "Value Pack" bundled hit in November of 2004. (Today, the system is $250 in a bundle with a memory stick you want, a movie you don't care about, and if you're a cranky gamer like us, a game you don't want. The $200 bare bones version has the system-- and that's it.) So we're hoping for a price drop to be announced very soon, otherwise we'd just buy the damn thing at full price. An if you have any respect for 2D gaming, you should probably buy one too. Yes, just for Castlevania. Do it. Another great portable game is coming, but a lot faster than we expected. Nintendo ported one Final Fantasy per year to the GameBoy Advance for the past few years, and then surprised us late in 2006 by dropping Final Fantasy VI on an already jam-packed RPG market, just weeks after Final Fantasy V hit in the USA. Well, it looks like Final Fantasy VI (known as III in the USA) is coming to the portable this week for about thirty bucks. If you didn't already beat Final Fantasy V yet, well, it looks like another quest awaits you, with Terra and Locke and, of course, Umaro. It's your favorite! Today at Galactic Hunter we look at the meanest Gungan out there, George R. Binks. Er, Jar Jar Binks. It came out in 1999, has a staff, and probably makes the character look a lot more like fans wished he acted. Is it worth your money? Read on! The folks at Master Collector revealed their next 3 3/4-inch exclusive figure to be none other than Copperhead, best known as one of the many pack-in pilot figures from the original toy line. It's based on the new sculpts (2000-2005 era) and, we must say, we're impressed. Were it not for 100% brand new sculpts coming out for the line come Summer, we'd be all over this. Many moons ago, Capcom released Super Puzzle Fighter II Turbo for the PlayStation and the Saturn from Sony and Sega, respectively. (And the PC, but that port was horrible.) The games did OK, and eventually went out of print. Then shot up to like $100 on eBay, and the PlayStation version was rereleased. And then it was ported to the GameBoy Advance and, in Japan only, the Dreamcast (where it had some form of online support). Why are we telling you this? To prove a point-- the game is damned good and well deserving of a great many ports. Today, the Capcom Puzzle World compilation hits stores for about $30. It has Puzzle Fighter on it, and from what we hear the port is basically the Dreamcast version (as in, extra extras). The disc also has three Buster Bros. games (which are fun) as well as an Arkanoid clone we've never heard of called Block Block. As we love Arkanoid almost as much as the gift of life itself, if not moreso given this hasn't been a great year, it may be well worth playing it when you buy this disc. But in all seriousness, we highly advise you to play Puzzle Fighter on any console possible if you have the means. In a world packed with Tetris clones, this is easily the best and, depending on your sensibilities as a gamer, as good as if not better than the Russian puzzler. If you play Puzzle Fighter and don't like it, don't tell us. It reflects poorly on you as a person, so it's best to keep this kind of shame to yourself. While we do not have a PSP in our current game stash, we're looking in to buying one shortly as, we're finding out every day, there's actually quite a few good games for the system. They're just all on clearance and out of print, and Sony's marketing for this console has effectively done nothing to highlight the "game" aspect of what the system can do. The funnier-than-you-might-expect 30 Rock appears to be going on hiatus. This is depressing, as any series that can manage to pull off a joke about the Hapsburg family, the misery of minimum wage jobs in show business, and the word "rural" gets big points in our book. 30 Rock should be back in April, or so we hope. Anything to keep away the ever-encroaching tide of reality TV. One of the replacement series is the wonderful Andy Richter, who will star in a show called Andy Barker P.I.. Bringing back any beloved character or actor and placing them in the role of some form of private investigator or cop is essentially creative bankruptcy. Just ask Bill Cosby, Michael Richards, Shatner, and even poor Jeff Goldblum. Roger, Roger! Today at Galactic Hunter we look at a droid that people aren't too fond of, with the Security Battle Droid. We like it, though. It has a lever for moving its arms, distinctive red markings, lots of articulation, and it just generally looks good. So should you get one? Read on! 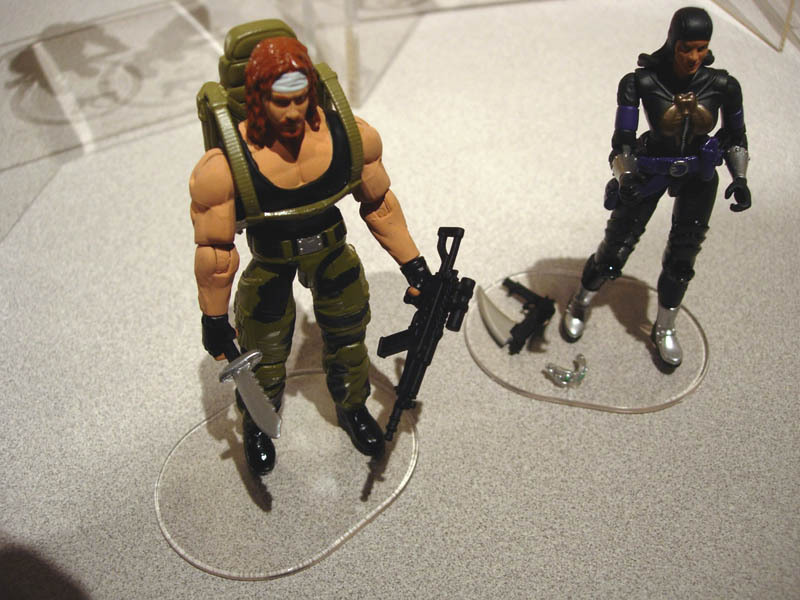 Master Collector, by way of Cobra Island, is reporting that the fourth wave of Joes shown at Toy Fair 2006 are cancelled. This means Mutinia, Lt. Falcon, Airtight, Outback, Night Viper, and the Cobra Officer are never going to be. The rumor is that none of these "direct" offerings were made in quantities much larger than 10,000 pieces, so it's a real pity to hear that these just aren't meant to be. Of course some brand new sculpts are just around the corner, but still-- there were some interesting figures in there. Silent, and fights fires! Today at Galactic Hunter we look at a hero of the saga with the Firespeeder Pilot. The fight fires, and in the hangars orbiting Utapau, they seem to be some sort of mechanic. Is this honorary Clone Trooper worth picking up? Read on! As you know, we do a little work in the toy business with Entertainment Earth and related companies. EE has a deal with Bif Bang Pow! to distribute (and help develop) some action figure properties, and we've been assembling some prototype figures for Toy Fair-- which we are not yet at liberty to discuss. We are, though, allowed to talk about this The Big Lebowski The Dude (Hoodie) Bobble Head, which as far as we know is the first and so far only piece of figural licensed merchandise based on the film. There will be more very soon, but this is a really nifty figure that's not too expensive. Over at NoFactZone.net, there are images of the brand new Ben & Jerry's Stephen Colbert's Americone Dream, which is a mock-up package that boasts "vanilla ice cream with fudge covered vanilla cone pieces & a caramel swirl." Hot damn, that sounds pretty good. There's even a (supposedly) official statement from Ben & Jerry's, so assuming this isn't some elaborate prank, well, we're curious to see what kind of licensed product Mr. Colbert lent his likeness to. Or "to which he lent his likness" to you grammar bastards out there. World of Warcraft Figures from DC Direct's "DC Unlimited"
While we've known about this for a while (and probably you have as well), everybody's a-talkin' about DC Unlimited's World of Warcraft license. SOTA Toys did three figures a while ago, and now DC Unlimited, which is part of DC Direct, is going to give it a shot. But wait, there's more! We also had a small hand with the Flash Gordon Bobble Heads, which so far includes Flash and Ming. These are available exclusively through EE Distribution by wholesale, but other stores should have them for we non-store folk. Each is $12.99 and are some of very few licensed products based on the 1980 Flash flick. From left to right: Boba Fett, Ketwol, Anakin Skywalker, Clone Trooper. These are all new since our last update, and another one will be going live today! Who will it be? Keep checking Galactic Hunter for the next update, with the 282nd installment in our ongoing series! Also, it's Toy Fair-- no, we didn't go this year. But you can see hundreds of photos from Hasbro at Galactic Hunter, with Star Wars and Marvel and all sorts of goodies. Every year, the guys at Altered States Magazine go to New York to cover Toy Fair in a big way-- there are tons of Transformers pictures as well as lots and lots of other brands. No matter your plastic poison, it's worth going to see everything they're showing right now as, odds are, there's a picture of it. First up: The Magic Box has two pages of Final Fantasy Anniversary Edition for the PSP. This (we're told) $40 or so retro title costs just as much as the NES/Famicom original nearly two decades ago, except it's on a smaller screen and is supposedly totally redone in terms of graphics and sound. We'd by lying if we said we weren't absolutely thrilled with how it looks, but we just bought the game for GameBoy Advance like three years ago. And we still haven't got around to re-playing it again yet. But $40? 3,990 yen? Geez. No date for a US release has been given but we're hoping Sony remembers the words "budget title." We've got an Alexander Hamilton here for the game-- but that's about as high as we want to go for a game we picked up brand new for the NES for $11 at a Best store. But wait, there's more! Remember all the wacky various Nintendo GameBoy Advance SPs they made for all the major game launches? Well, the DS Lite is getting another one, finally. Which we think means there are far too many Final Fantasy products on the market from Fall 2006 to the present and forseeable future-- assuming you give up on all other gaming genres, how can you possibly hope to play through all this stuff? But wait, there's still more! Now there's a plush Ming. (No other plushes yet.) He needs hugs, so give him a hug. Click through to see it. There's a fine line between the concepts of classic rock, dinosaur rock, and some sort of zombie rock. The 1980s are a bottomless well of potential when it comes to reuinions and re-touring, and it seems The Police are really going to tour again this year. They were even on the Grammys last night, giving the otherwise worthless industry wankfest some level of what can be loosely termed as merit. But we do love The Police. (Not as much as Wall of Voodoo. Or Oingo Boingo. Or Devo. But they're up there and we did buy their records to listen to in college. [Which was actually like five years ago.]) So kudos to you, old British guys, and may you earn more than enough scratch to just do one good tour and not end up making a "new record" that nobody likes. Your originals are great enough. And Danny Elfman, we call on you to do the honorable thing and tour with Oingo Boingo some more. C'mon. Do it. Target exclusive! Today at Galactic Hunter we look at a hard-to-find Clone Trooper that was based on but did not appear in the films. It cost $12.99 and had two guns with it. Surely, that's worth your time and money, right? Read on! If you can't get enough of Adam's rambling, check out the new column at Anime News Network called Super Plastic. Currently, a new installment is scheduled for every two weeks, and this week's looks at the Revoltech Evangelion 01 figure. Lots of swappable hands, weapons, and articulation galore. Click to read it. Or, better still, don't read it. Just read this forum thread that started about it. The funny thing was that it started in less than 45 minutes after it went up. We're so loved. So, this week you can get NES Ice Climber, Kirby's Adventure, and Kid Icarus. Ice Climber is fun but very primitive-- we had it back when it was still new-ish and it was primitive compared to other second-generation NES titles. Kirby's Adventure is ridiculously fun but it's still an old NES game. (A damn good one though.) Kid Icarus is also fun, but, again, old timey. Worth playing, though, so if you have some money to burn this week's offerings are worth a look. They're all direct from Nintendo, after all. Also, NCS put up this page showcasing some really cool dot magnets based on the original Dragon Quest on the NES/Famicom. Impressive. Look, here's a figure you can forbid your kids to buy/look at! It's the Ikki Tousen Ryomou Shimei Kneeling with Handcuffs Statue, which brings the world a roughly 12-inch scale fighting maid missing most of the middle of her costume and handcuffs to American shores. (Finally!) You can pre-order this classy lady today! Swedish mothers! Today at Galactic Hunter we look at Anakin's mom, Shmi Skywalker. As the first (and we assume, only) figure of this character, it's not like you have a lot of choice if you want to add a figure of Shmi to your stash. Is she worth it? Read on! If your girl-- or boy-- owes you a favor this Valentine's Day, perhaps you might want to look at this amusing item. The whole idea of the French maid costume is really nothing new, but this is the first time we've seen a licensed one. NCS has the He is my Master Maid's Uniform for $35. While we're not sure what makes it better/different than a standard maid garment, we can appreciate the sentiment, the novelty, and the fact that some lucky schmuck is going to be able to convince his gal to parade around in one of these on Valentine's Day. Kudos to Sega for a licensed product worthy of our time. So, there's a start. Now where's the G-Taste stuff? Today at Galactic Hunter we start with a look at the wolfy Lak Sivrak. He was cut out of the original Star Wars when the Special Editions came in to being, but that didn't stop an action figure from being made in 1998. Should you snag one? Read on! And who could forget Greedo. He's had five modern action figures, and this one was an exclusive to Wal-Mart in 2002. Is it the best? Or just OK? Read on! Well, the end is near. The Transformers Classics Legends Wave 2 Set is in stock at Entertainment Earth, meaning it'll be at stores soon-ish (or available to order now). Sadly, these figures represent the final non-exclusive offerings in the Transformers Classics line unless Hasbro decides to surprise us all and announce something. The set includes Menasor, Bumblebee, Jetfire, and Whirl. Click through to see them, or don't. Well, that's all for us. Back to playing more Salamander. From left to right: General Grievous, Adi Gallia, Kabe, WEG-1618. These are all new since our last update, and another one will be going live today! Who will it be? Keep checking Galactic Hunter for the next update, with the 290th installment in our ongoing series! It's not as exciting as the currently avalable Classics Ultra Magnus vs. Skywarp set (which isn't selling worth a damn here in LA), but AcToys.net has revealed this Optimus vs. Megatron gift set which is labeled as a Target exclusive. What do you get? 4 Legends of Cybertron-sized toys, with each leader from its movie and Cybertron appearances. So in short, no new molds. We don't have a release date for this set or an official price, but based on what it is and previous exclusives, we'd be surprised if it cost a lot more than $9.99. We're pretty pleased with the concepts behind the movie Legends toys thus far, but still, would some Classics molds have been too much to ask for here? Ad: Tonight, we dine in Hell! Well, we don't-- the Spartans might though. The 300 Spartan Helmet Prop Replica is in stock at Entertainment Earth, and it's already sold out once before. This limited edition item would look great on your shelf-- or perhaps on your head. If you're interested in props, lunch boxes, action figures, or scrolls from the film, click through and see what's available. Today at Galactic Hunter we start with a look at the bearded Endor Rebel Solider from 2002. This one is particularly cool because the head sculpt isn't from the movie, but in reality is based off of a Kenner designer who has been on the brand since pretty much day one. Who is this handsome fellow? Read on! Read on! Next, there's the Power of the Jedi Sandtrooper. It comes with a backpack, binoculars, and a gun. So why haven't you already bought a few? Read on! In recent years, the video game industry has held off most of its major releases for Q4-- meaning, "we need a strong new game for Christmas." The end result were a lot of gamers getting annoyed that products are a) rushed to market, and b) not released during the rest of the year when, you know, we have free time. Nintendo reported shortages on both its DS and Wii hardware, so who knows if the numbers might have gone up (or down) with a greater supply. It seems to be a great time to be in the game business! Soundwave, Grimlock, Shockwave, and Bumblebee in their G1 styled bodies are the first revealed "Galactic Heroes" style figures from what seems to be a new line from Hasbro. The Allspark mirrored the galleries from this seller's eBay auctions. We are pleased. These new figures join similarly sized and styled figures from Star Wars, Marvel Comics, and Spider-Man. These figures seem to try to be more G1-esque than even the recently released Classics range. We expect each new 2-pack to be about $6. New to stores, the Capture of Tantive IV Battle Pack has 2 Stormtroopers, 2 Rebel Troopers, Darth Vader, and is in stock at Entertainment Earth now. Click through for pricing and availability. From left to right: Anakin Skywalker, Luke Skywalker in Stormtrooper Disguise, Obi-Wan Kenobi, Tessek. These are all new since our last update, and another one will be going live today! Who will it be? Keep checking Galactic Hunter for the next update, with the 296th installment in our ongoing series! The cats at The Magic Box have info and images of the new Wii party game, including shooting Boos in a haunted house, cake decorating, and racing around on go-karts and mopeds. Who can say no to that? Xbox Live Teenage Mutant Ninja Turtles 1989 Arcade Game? As children of the late '70s and early '80s, we watched more than a fair share of Teenage Mutant Ninja Turtles on TV. And read the comics. And bought the toys. And played the video games. So you can guess that we were pretty jazzed to see what might be some leaked images of the original arcade game coming to Xbox Live, which, sadly, means that we may need to buy that Xbox 360. Assuming it's legit, Xbox 360 Fanboy has the full scoop. A lot, and we do mean a lot, of announcements have been made over the past few days. Too many, we dare say. But as you're mature readers, we're sure you can take it all in. Robot Heroes: Now there are eight known figures in this line, which we presume makes up the first wave (if Marvel Superhero Squad is any indication.) Before, we saw Grimlock, Shockwave, Bumblebee, and Soundwave. Now, you can see Optimus Prime & Ravage as well as Rodimus and Insecticon. Rodimus is really Hot Rod, of course, and Insecticon is a renamed (presumably for trademark reasons) Shrapnel. It remains to be seen what they'll call Kickback and Bombshell if we ever see them. Movie Toys: Enterprising fans took some videos at Toy Fair in New York, and now you get to see two toys in action. Click here for Optimus Prime Battle Rig Blaster, and click here to see the movie Automorph features of Optimus Prime. Comics: Apparently they're going to do a crossover between The Avengers and Transformers. God only knows why. Read more at Comics Continuum. Japanese News: Over at Fan2Fan, you can see bunches of stuff today. There are pictures and information of the BinalTech Black Convoy, packaged Masterpiece Edition Megatron, Revoltech Megatron, Nike Transformers Sneakers, new music concept images, and tons of other stuff. By not looking, you offend the noble spirits of ancient Cybertron. Formerly a Toys "R" Us exclusive, the now-shared Star Wars X-Wing Fighter Vehicle with Luke Skywalker Figure is up for pre-order (and on sale) at Entertainment Earth now-- until Friday, you can save $5 on this fine item. It also includes removable swamp moss, and a Dragonsnake creature/beast. (It's pretty awesome overall, the paint on this X-Wing is arguably the best of any modern toy based on this vehicle.) Click through for pricing and availability. When we heard that the Fox News Channel was producing a show that attempts to re-create what The Daily Show did for Comedy Central, we were intrigued. (This was, of course, to satirize anyone with any power in the public eye, regardless of their political leanings.) Be it Clinton or Bush, The Daily Show managed to skewer anybody who dare speak in the public eye if caught on camera. Fox News forgot this, and decided that it'd be a good idea to make a show that appeals to its core demographic and if its pilot episodes are any indication, they forgot to bring the jokes. The show is much closer to SNL's famous "Weekend Update" sketch in which two talking heads at a desk fire off jokes while special commentators or pre-taped segments flesh out the sketch. It's a format that works well late at night when the goal is making a joke at anyone or anything, but the show's lack of "teh funny" reminded us that in making good comedy, you have to assume everybody's a fair target. As a pilot that was no doubt produced a while ago before airing, we expect the material to be either a) stale or b) "timeless" in the sense that it has to be somewhat fresh for a few months before the routine of production picks up. A couple of no-name anchors sitting behind a desk while a laugh track plays doesn't help, either, as we're pretty forgiving of bad starts for new comedy. The first episode of Jimmy Kimmel Live! was very awkward, as the show was being retooled on the fly with some of the planned core bits (like a bar on the set) were eliminated seemingly hours before production. The first episode of The Colbert Report felts very awkward, but unlike The 1/2 Hour News Hour, you could tell that it was setting a high standard that it would have to grow in to. There's absolutely room for conservative comedy on TV, but great political comedy doesn't play favorites, and without a strong funny voice behind the desk we expect this show to take quite a while to find its footing, if it ever does. So unless they plan on hiring a Dennis Miller or someone who might be able to make this very difficult "let's give half of the country a free pass" format work, we continue to plan on not watching it in the future. Political leanings aside, it's not hard to make a good jab at the blue states. So Jon Stewart, Stephen Colbert, Bill Maher, and the rest of you, we have good news: there's nobody nipping at your heels for the "other half" of your audience just yet. Although if Comedy Central wants to spoof left-wing talk shows, maybe they should consider giving a full show to David Cross' very funny Russ Lieber character from The Colbert Report. Today at Galactic Hunter we start with a look at the second-ever action figure of a Spirit Obi-Wan Kenobi, this one came out around late 1998. Packaged along with a Yoda and Anakin Skywalker in a three-pack, could this be the best-ever set of Jedi Knights from beyond the grave? Read on! Today in the USA, Nintendo released three new games on its Virtual Console network. The big dog is The Legend of Zelda: The Ocarina of Time, previously released for the Nintendo 64 and on a couple of promotional Zelda collection discs for the GameCube. Also added were Sega's Bio-Hazard Battle for the Sega Genesis and Chew Man Fu for the TurboGrafx-16. Also, Hudson announced some more new titles for later this (or rather next) month. Splatterhouse 2 was a TurboGrafx-16 hack-and-slash gore game, and that's due in March alongside Double Dungeons, an RPG we've never heard of before. So it must be great. If you can't get enough of Adam's rambling, check out the new column at Anime News Network called Super Plastic. This week, we look at the Air statue of Minagi Tohno, a (we're told) Entertainment Earth exclusive in the USA, otherwise distributed and manufactured worldwide by Organic Hobby. Click to read it. More again in two weeks! We dropped in to a local Kay-Bee Toy Store last night to find the Hasbro Sideswipe reissue from the original Transformers line newly marked down to a mere $9.99, formerly $14.99. It's a pretty good deal if you want an old timey toy at old timey prices. Check your local store for availability. Today at Galactic Hunter we start with a look at the first-ever action figure of a Aayla Secura, a comic character who made the leap to the big screen in 2002 and to the world of toys in 2003. As a bad girl-turned-hero with very tight pants, could this figure bring you something your collection is missing? Read on! If you've been jonesing for Star Trek news, The Trek Movie Report has been packed with tasty tidbits about casting, appearances, and other exciting rumors over the past few months. And what are their latest rumors? Well, they say that the official release date is December 25, 2008 for this new movie, and that there's a possibility that Matt Damon, Adrien Brody, and Gary Sinise are going to be Kirk, Spock, and McCoy. Color us curious, as that doesn't sound half bad. As far as rumors go, we like what we're hearing so far. Why mess with tradition? The third annual club exclusive membership toy has been revealed, and The Transformers Collector's Club has revealed its newest addition to be Breakaway, a redeco of the Transformers Energon toys previously sold as Windrazor and Treadshot. Both are solid toys, but this one barely breaks any new ground-- still, it's a limited exclusive, and as such we still find it and its clear Energon bits interesting.